Here is more information on dyamic versus static typed languages. Blockly supplies variable fields which are dynamic dropdown boxes that show the names of variables the user has provided. Below is an example of one. Specify a variable type and its blocks, including getters and setters. 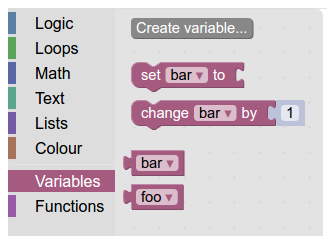 Configure the toolbox to use your variable type and blocks. Define generators for variables and their blocks. The most basic blocks for accessing and manipulating a variable are the getter and setter blocks. Let's walk through the getter and setter blocks that Blockly provides. // Block for variable getter. // Block for variable setter. An important detail to notice is that by setting the variable getter's "output" to null, the return value can be of any type. Also, notice that variable setter's input does not specify any checks. As a result, the variable can be set to any type of value. You can add getters and setters that enforce type checking. For example, if you have created a variable of type "Panda", the following definitions create a getter and setter with the appropriate types. // Block for Panda variable getter. "output": "Panda",    // Returns a value of "Panda"
// Block for Panda variable setter. "check": "Panda"    // Checks that the input value is of type "Panda"
This creates two types of blocks, a getter and a setter. Their dropdowns only display variables of type Panda. Their inputs and outputs only accept connections with type Panda. By default there is no visual indicator to tell the user which type is being used. One easy way to differentiate variable types is by colour. Note: The variableTypes key is optional on a field_variable. If it is undefined only variables of the empty string type "" will be shown. To show all variables of any type use "variableTypes": null. 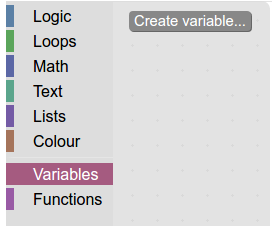 To make this new type of variable useful to your users, you need to add a way to create and use the new variables. Create a new dynamic category for variables if you do not already have one. Add your new getters and setters to the category. If you don't want untyped variables to be accessible to your users, you will need to remove their getters and setters from the toolbox. Next, your user needs a way to create variables. The simplest way is with a "Create Variable" button. and a Panda typed variable will be created! The easiest way to allow users to create variables of multiple types is to have one "create" button per type (e.g. Create String Variable, Create Number Variable, Create Panda Variable). If you have more than two or three variable types, you can quickly end up with too many buttons. In this case, consider other options like replacing the variable creation modal with one that includes a type selector. Finally, you will need to define generators for your new variable blocks. You can also access the list of variables directly with Blockly.Workspace.getAllVariables() to get all variables of all types or Blockly.Workspace.getVariablesOfType() to get all variables of a specific type.